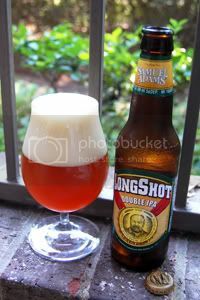 One of the releases I look forward to most each year is the Samuel Adams Longshot pack. The pack is composed of two winning beers from the American Homebrew Contest and one beer from the Boston Beer Company employee's competition. I absolutely love that Samuel Adams has such a commitment to homebrewing, and I love the fact that some of the best homebrewer's beers make it to my local liquor store even more. Unfortunately, due to the hop shortage last year, Mike McDole’s 2007 champion Double IPA was unable to make it to production. Mike brewed the beer as a Pliny the Elder clone that clocks in at about 100 IBUs, so you know there were a hell of a lot of hops involved. It wasn't a case of the hops simply being too expensive, some of the seven varieties in the recipe were just unavailable at any price at the time. Well, the wait (and hopefully the hop shortage) is over, and the beer is finally here. Lets see if it was worth the wait. Appearance: A deeply hazy, dark orange body capped by a generous mountain of off-white head that sticks around a long time and leaves great curtains of lace behind. Top marks. Aroma: Intense and pungent citrusy Cascade-like hop oil absolutely explodes from the glass. Underneath it all, there's a solid caramel malt base accompanied by a nice dose of booze. Taste: Up front, a brilliant flourish of bitter, herbal, grapefruity, piney, and resiny hops. After the initial hop blast, there's a solid caramel malt backbone to keep the hops somewhat in check. The alcohol is masked well enough and there's plenty of bitterness in the finish. This is no slouch, but a proper West Coast style Double IPA. Mouthfeel: A creamy, slightly fuller than medium body with good carbonation. A dry finish. Drinkability: Just what you'd expect from a full-bodied, full-hopped, and fully-potent Double IPA. Verdict: I've waited quite a while to try this beer, and it didn't disappoint. Congratulations Mike, you've brewed up a great beer here! I'd love to see Sam Adams base a year-round Double IPA on this recipe as the newest addition to the Imperial Series.